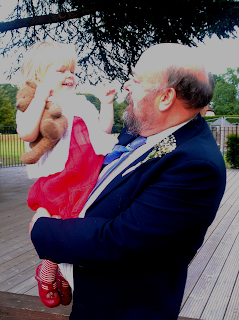 Father’s day blog posts – a celebration of Dads! Dads are often left out in the cold where breastfeeding is concerned. Well of course they are! They don’t have breasts, can’t produce milk… It’s no wonder many men are left feeling a little like spare parts when it comes to feeding, and we’ve all heard comments about bottle feeding “allowing Dads to bond with their babies”, as if it was the only possible way. While men are encouraged to take active roles in every other aspect of pregnancy and parenting, breastfeeding seems to stand outside this. Our (otherwise brilliant) NCT classes included a “women only” breastfeeding session with no equivalent education or support for male partners. We learned about the latch, breastfeeding holds and potential issues, knowledge of which would have definitely helped Mr MilkChic support me as I tried to establish breastfeeding. In fact, research shows that Dads are incredibly important in successful breastfeeding relationships. Women who feel supported by their partner are not only more likely to start breastfeeding, but also continue for longer. Get involved from the start – discuss feeding options together and learn about potential “boobie traps” that might jeopardise the breastfeeding relationship. Make it your job to get a list of local support groups etc. so you can get help quickly if she needs it. Be part of the feeding routine. Just because you don’t physically feed your baby doesn’t mean you have to be excluded. In the first few months, those may be the only quiet minutes you get to spend together as a couple – make the most of them! Carve a niche for yourself – Mr MilkChic was much better at winding small one than me, and I was relieved when he took over the job almost entirely. Both he and my teenage stepson took manly pride in the “efficiency” of their burping techniques, reaping the benefits inÂ sleepy cuddles afterwards. It is heartbreaking when your partner is suffering and you feel unable to help. Channel your energies into ensuring she has every comfort and support – cushions, creams, shields etc. etc… your job is to research, source and apply as necessary. If she’s not getting the support she needs, act as intermediary and insist that help is provided. Try not to push formula. Not because formula is necessarily bad, but because you are between a rock and a hard place. Breastfeeding is an emotional issue and “giving up” can leave mums feeling both sad and guilty. Equally, don’t harp on about the benefits of breastfeeding. If she’s continuing to try and feed in the face of real difficulties, she is only too aware of them. Expect tears or anger. Probably both. If things get really bad, the only person who can make the decision to continue or to stop is your partner. Whatever she decides, back her up. It’s natural to feel protective of your partner when she nurses in front of other people, but if you are nervous, try not to let it affect her confidence. Your attitude can make the world of difference, so make sure she knows you support her 100%. Should any ignorant fool (technical term) dare to disapprove of your partner breastfeeding in public, firmly assert her rights on her behalf. This is one occasion where you are fully within your rights to be over-protective – someone is suggesting you should deprive your baby of food. Even if she finds your reaction embarrassing, she will still love you for it. Most mums need a bit of a boost post-baby. They’re exhausted, their bodies don’t feel right, none of their clothes fit… and everyone they’ve ever met wants to come and visit! On the bright side, you don’t have to do a lot to make her feel pampered – just giving her 10 minutes to shower baby-free is a luxury. If you’re after real brownie points, book her a haircut and go along to babysit, or pop to MilkChic to find some flattering breastfeeding clothing. Happy Father’s Day to all the wonderful “breastfeeding Dads” out there. Your support makes everything easier.